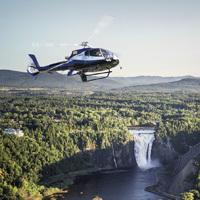 Helicopter - Tour - Quebec - 25 min.- 1pers. Explore Quebec City and the Saint Lawrence River from the air! Location: Jean Lesage airport in Sainte-Foy near Québec city center. Duration of helicopter tour: 25 minutes. Take in the charm of Quebec City and the mighty Saint-Lawrence River. Fly over all the magnificent attractions of Quebec City, including the Château Frontenac, Old-Quebec, the plains of Abraham and more! Take in the beauty of the 83-metre-high Montmorency Falls nestled between the river and the cliffs. The majesty of the Saint-Lawrence River is sure to amaze and enjoy the charms of île d`Orléans, an enchanting harbour in the middle of the Saint-Lawrence. An unforgettable flight! The impressive Montmorency Falls, nestled between the river and the cliffs. The verdant île d`Orléans and the bridge. The Château Frontenac overlooking the majestic Saint-Lawrence from the Dufferin Terrace. Quebec City Fortifications and the Citadel. Old Québec, a UNESCO World Heritage Centre. Cap Diamant, the highest natural point in Quebec. Battlefields Park (Plains of Abraham). Quebec Bridge and the Pierre-Laporte Bridge. Audio guide available in English, French, German and Spanish. A guided VIP tour of the Helicopter hangar and maintenance centre *. Free access for one person to the Helicopter Discovery Hub and access to the flight simulator *. * Complimentary activities offered subject to availability. This package is for one person. * 2 passenger minimum per helicopter is required for take-off. Possibility of pairing with another passenger when possible. Maximum weight for participant: 280 lbs (127 kg). Minimum cancellation time - 48 hours. No refunds given for last minute cancellations with less than 48 hours notice. Be sure to arrive at least 30 minutes before the departure time.